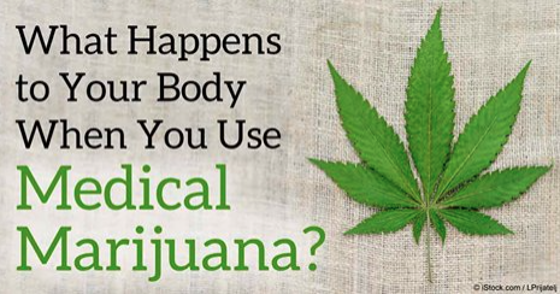 Home » Health » What Happens To Your Body When You Use Medical Marijuana? Read on to learn more about medical marijuana’s healing benefits, how it has gotten its bad rap, and find out why you’d want your own state to approve its use, too. The term “medical marijuana” refers to the use of the whole, unprocessed marijuana plant and its pure extracts to treat a disease or improve a symptom. It must be sourced from a medicinal-grade cannabis plant that has been meticulously grown without the use of toxic pesticides and fertilizers. Marijuana’s incredible healing properties come from its high cannabidiol (CBD) content and critical levels of medical terpenes and flavonoids. It also contains some tetrahydrocannabinol (THC), the molecule that gives the psychoactive effect, which most recreational users are after. Through traditional plant breeding techniques and seed exchanges, growers have started producing cannabis plants that have higher levels of CBD and lower levels of THC for medical use. Although the Food and Drug Administration (FDA) has not yet approved medical marijuana, more and more physicians are starting to reverse their stand on the issue and swear by its effectiveness and health benefits. In a previous CBS interview US Surgeon General Vivek Murthy acknowledged that marijuana may be useful for certain medical conditions. Likewise, CNN's chief medical correspondent and neurosurgeon Sanjay Gupta also made a highly publicized reversal on his marijuana stance after the production of his two-part series "Weed." How Does Medical Marijuana Work and What Diseases Can It Help Treat? Cannabinoids interact with your body by way of naturally occurring cannabinoid receptors embedded in cell membranes throughout your body. There are cannabinoid receptors in your brain, lungs, liver, kidneys, and immune system. Both the therapeutic and psychoactive properties of marijuana occur when a cannabinoid activates a cannabinoid receptor. Dr. Allan Frankel, a board-certified internist in California who has successfully treated patients with medical marijuana for less than a decade, has personally seen tumors virtually disappear in some patients using no other therapy except taking 40 to 60 milligrams of cannabinoids a day. CBD also works as an excellent painkiller and works well in treating anxiety issues. Cannabis oil, on the other hand, when applied topically has been proven to heal sunburn overnight. In states where medical marijuana is legal like California, Colorado, Vermont, and New York, you can join a collective, or a legal entity consisting of a group of patients that can grow and share cannabis medicines with each other. By signing up as a member, you gain the right to grow and share your medicine. A patient at the age of 18 can secure a medical cannabis card recommendation letter if their attending physician or doctor of osteopathic medicine (D.O.) advises or agrees to it. With your medical cannabis card, you now have the liberty to choose the collective you want to belong to. Inhalation – Allows the patient to titrate the dosage. It has an instantaneous effect as the medication is rapidly taken into the lungs and quickly absorbed through the capillaries into the bloodstream. The effects of inhaled cannabis will last approximately four hours. Smoking – Can be done using a joint or the cigarette form (hand-or machine-rolled), a pipe, or bong (water pipe). While smoking medical marijuana by joint is believed to be inefficient because the medication goes with the smoke as the cigarette burns, smoking small amounts using a water pipe is more advisable because the cool smoke is less irritating to the airway. Vaporization – Like a nebulizer treatment, cannabis can be heated to a temperature that will release the medication in vapors to be inhaled by the patient. Sublingual (under the tongue) or oramucosal (in the oral cavity) delivery – Made possible using oils or tinctures, it is readily delivered into the bloodstream and provides a rapid effect. Tinctures can be administered through a dropper under the tongue or sprayed in the mouth to be absorbed in the oral cavity. This is highly recommended for non-smoking patients. Oral ingestion – Non-smokers can also take medical marijuana through pills or mandibles, which are edible cannabis products in the form of teas, cookies, or brownies. The primary drawback of this approach is that because cannabinoids are fat-soluble, there may be issues when it comes to absorption, depending on the patient’s metabolism. A good workaround for this problem is using cannabis butter, which fat-soluble cannabinoids blends well with. Topical application – Cannabis can be applied as an ointment, lotion, or poultice for treating skin inflammations, arthritis, and muscle pain. It is unclear how cannabinoids are absorbed transdermally, although its credit should also go to the more soluble terpenoids and flavonoids that also have anti-inflammatory properties. Keep in mind: making sure that your medicine has been sourced from a medicinal-grade cannabis plant without the threat of chemical residues, which may cause further harm, should also be a top-notch priority. Dr. Margaret Gedde, a Stanford-trained MD PhD pathologist and award-winning researcher who specializes in the therapeutic use of cannabis, says the only concern you’ll have to worry about medical marijuana is the psychoactivity of THC or its ability to make you feel “high.” Although in some cases, THC may be beneficial, too, especially for patients suffering from severe pain. But aside from that, cannabis is generally safe to use. You can also avoid this side effect by specifically looking for high CBD and low THC marijuana formulations. The risk brought by different versions of synthetic marijuana should also be considered. Imported from Asian countries under the guise of potpourri, herbal incense, and even plant food, the synthetic powder is mixed in a lab and shipped to the US, where retailers spray it onto a leaf─ often an herb or a spice─ that can be smoked, just like pot. It binds to cannabis receptors in your body up to 1,000 times more strongly than standard marijuana, as well as producing gripping effects on serotonin and other receptors in your brain. I highly recommend inquiring to your physician or D.O. about reputable medicinal-grade marijuana plant growers or credible apothecaries near your area that sell natural cannabis products for medicinal purposes. "What happened in the '60s and '70s was that due to desires for psychedelia, the changes in the war in Vietnam, and the war on drugs with Nixon, the types of strains that were available and the demand for psychedelia changed. Before we knew it, CBD—due to a lack of 'stoniness'—was bred out of the plant."